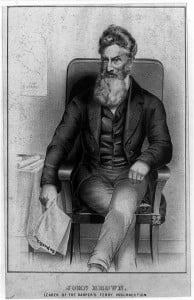 John Brown was perhaps the most famous person involved in the abolitionist movement who fought against slavery in America leading up to the Civil War. He was born on May 9th 1800 to a deeply religious family. The entire idea of people living in slavery went against everything he believed. He was determined that he would do whatever it took to end the institution of slavery. During the 1850’s he went to Kansas and took an active role in the fighting between pro-slavery groups and abolitionist groups living there. This became known as Bleeding Kansas. On the night of May 24th 1856 Brown led a group consisting of four of his sons and three other men to Pottawatomie Creek where several pro-slavery men had their homes. Brown’s first target was a pro-slavery man named James Doyle. Arriving at Doyle’s home he knocked on his door. When Doyle answered the door he was forced outside along with two of his sons. Brown and his group led them a short distance away and butchered all three of them with swords. John Brown then shot James Doyle in the head after he was already dead. After the murder of James Doyle and his sons John Brown and his group next found Allen Wilkinson and William Sherman who they also murdered that night. In all Brown and his men murdered five men. Brown was never captured or prosecuted for this crime. A great biography about John Brown is To Purge This Land with Blood: A Biography of John Brown. On October 16th 1859 John Brown and twenty-one of his men went to Harpers Ferry Virginia in order to capture the town and seize the federal arsenal there. 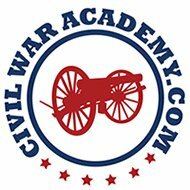 Their plan was to seize the arsenal and take it’s weapons, they would then send some members of their group to nearby locations where slaves lived, these men would convince the slaves to join their group. The slaves would be provided with weapons from the Harpers Ferry arsenal to form a slave uprising which would hopefully destroy the entire institution of slavery. They thought they could hide out in the mountains and start a guerrilla war against the government and bring in more and more slaves to their cause. Unfortunately for Brown and his men no slaves came to their aid. There was no mass slave uprising. The local militia commanded by Robert E. Lee arrived and quickly put down this small insurrection. John Brown was found guilty of treason against the United States and hanged on December 2nd 1859. If you’d like to learn more about the trial of John Brown an excellent book is John Brown’s Trial. John Brown’s ideas were noble and his heart was in the right place, he just went about it in entirely the wrong way. He was also not a very good tactician. The raid on Harpers Ferry was doomed to failure before it even began. The fact that he attacked an entire town with a handful of men in the hopes that an enslaved population would rise up and come to his aid is pretty far fetched. Brown was a fanatic and he was so determined to dismantle slavery that he devised a poorly planned and poorly executed attack which could never have succeeded. His raid did have some positive effect. Some people in the north viewed John Brown as a hero and they became inspired fight even harder against slavery. Conversely southerners were shocked that white people were now taking up arms against slavery and were willing to give their lives for this cause. This certainly increased tension between the north and the south in the lead up to the Civil War.